Imagine taking the accumulated hair from every brush you have ever owned, rolling it into a giant, tangled mass, gluing it around your body and walking around like that for years. Sounds pretty awful, right? Right! 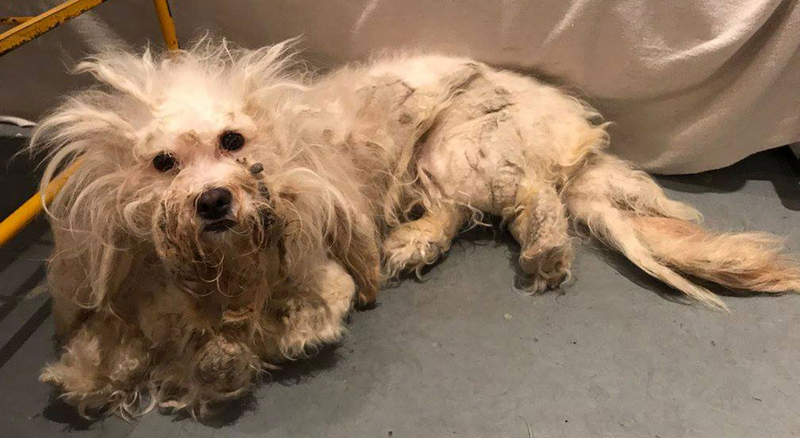 This form of neglect in dogs, a lack of grooming ascending to felony cruelty levels, is something we see at TJO on a weekly basis. Dogs with urine scalding from ammonia soaked mats, limbs choked and severed by entangled hair, impacted feces; you name it, we’ve seen it. Years ago our cruelty cases were focused around blood sports, and while we do know that dog and cockfighting still happens, we see these cases less and less often. Instead, we are confronted with the “new cruelty;” small breed dogs that have gone without grooming for years. I’m not talking “Fluffy has a dreadlock and could use a bath” lack of grooming. I mean “Oh my god, there’s an actual dog under that immobile mass of hair and feces? !” lack of grooming. We are we seeing this kind of neglect more often? I’m not sure. New England has done a great job unraveling pet overpopulation. I wonder if we have also done such a great job, through tougher laws and more ACO training, of investigating and prosecuting the more straight-forward cruelty cases, that we are now moving into a new, more subversive era of cruelty. It’s easy to identify cruelty when you see an emaciated pit bull shivering in a foot of snow wearing a 10 pound tow chain. It’s less easy when you see your neighbor’s shaggy Lhasa Apso vehemently barking through the window at passersby. I guess my message is that cruelty isn’t always obvious, and, it’s not always intentional in the way we have historically thought of it. It takes many shapes and many forms, and our efforts to combat it also have to constantly evolve. I always advise members of the public that if they see something, say something, even if they aren’t exactly sure what that something is. And, reach out to their local ACO’s and animal welfare professionals when they need help; after all, we are all in this tangled mess together.